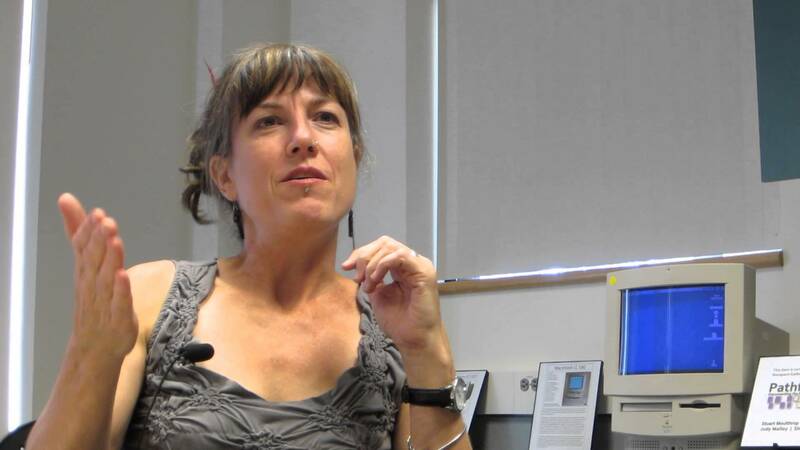 This interview of Shelley Jackson, conducted by Dene Grigar, took place on Friday, October 18, 2013 in the Electronic Literature Lab at Washington State University Vancouver as part of the Pathfinders project. The interview is divided into nine videos and provides insights into the development of the work. The commentary is written by Moulthrop. Jackson, Interview 1, "Exploring Hypertext Remix"
Jackson and Grigar discuss the tension between fragmentation, which some see to be an essential quality of hypertext, and the literary idea of unity. Jackson resists that idea that hypertext works against the unity of literary writing, pointing out that the very conception of the work joins her writing to previous print sources. There is a discussion of feminist theory from the 1970s and 1980s, especially French feminism, and Jackson's engagement with the idea of plural identity, ostensibly as an aspect of feminine consciousness (an idea for which she shows some skepticism). Jackson reflects on the experience of returning to Patchwork Girl after nearly 20 years, saying that she had initial anxiety but ultimately feels "proud" of the writing she has done -- though dissatisfied with the gap between her artistic intention and the limitations imposed by Storyspace. Grigar asks what Jackson might have done (or might do) differently if re-writing Patchwork Girl with more contemporary software. Jackson resists the idea, explaining that Patchwork Girl emerged from the specifics of Storyspace, especially its visual signature of boxes in rows, which suggested to her both the Graveyard (headstones) and a patchwork quilt. The work "is about text as body," and is in some sense inseparable from its (technical) embodiment. A smoother, more intuitive interface wouldn't do. The work needs it discontinuities, its patches. Jackson talks about the history of Patchwork Girl, noting that it began with the final assignment in George P. Landow's graduate theory class at Brown in 1993 or 1994, where students were required to create a hypertext. In some sense, Patchwork Girl began as a series of doodles in the margins of Jackson's notebook "while listening to [Landow] lecture." These were images of monstrous, scarred, female bodies. As Jackson goes on, she connects the Landow sketches to an earlier academic encounter, a course taught by the poststructuralist theorist Avital Ronell (most famous for The Telephone Book) at Berkeley in the early 1990s, before Jackson came to Brown. Jackson says she has never acknowledged her "debt" to Ronell and is now correcting the omission. From Ronell she learned that it was possible to read older, traditional literature through the lens of contemporary theory. So began a fascination with Frankenstein (covered in the Ronell class) and particularly with the "chopped-off" story of the female monster. DG: Had you read The Telephone Book before writing Patchwork Girl? SJ: "I had fingered it." Jackson, Interview 3, "Stitching the Patchwork Girl"
The immediate product of the Landow course was a "meta-hypertext" about female identity, materiality, and bodies: "the gnarl of theoretical concerns that informs my project." One of her Brown professors, Coover or Landow, showed the work to Mark Bernstein of Eastgate, who proposed to publish, though Jackson deferred the offer, wishing to expand and complete the work. The earliest part of Patchwork Girl was a series of theoretical meditations, along with the first part of the monster's story. The rest of the story came later, along with Quilt, Graveyard (and possibly Broken Accents, unless that is the older "theoretical" part). Quilt and Graveyard both reflect Jackson's interest in fragmentation and discontinuity. Grigar asks Jackson to relate these properties to her encounter with Storyspace as a tool, asking if Jackson had considered using other hypertext or hypermedia tools at the time. She did not, and explains that she was strongly attracted to Storyspace, liking particularly how she could see links and move passages of text around in a spatial context. Jackson explains that she thinks even of traditional, linear works as composed of moveable bits and pieces, so Storyspace was something of a revelation. "You can thank Mark Bernstein for that." Jackson, Interview 4, "Revolutionary Patches"
Grigar asks a hard question (for which we can blame Stuart Moulthrop): What would you consider the most significant innovation of Patchwork Girl? "This is the sort of question you shouldn't have to answer about your own work," says Jackson (fairly enough) -- but she goes on to offer a "long answer" to the inappropriate question. Jackson notes that the mainstream print world hasn't moved much further toward an embrace of discontinuity and fragmentation than it had in the mid-1990s. There is a "bizarre rhetoric" in popular criticism about the "naturalness of linear story form." So a first cut at Patchwork Girl's innovation would be the way it stands against this tendency. Beyond that, Jackson notes that she found herself "standing on the coast of a new world," as she considered what would be possible with emerging media. DG: "Do you still feel that way?" Jackson: "I do." She goes on, wondering why literary critics and writers are so averse to "play." Why so much anxiety about the way new work integrates with old? Patchwork Girl does not invalidate Dickens. "I might prefer to read Dickens instead of Patchwork Girl" -- though, she adds, "that doesn't mean there shouldn't be a Patchwork Girl." Jackson turns to other threads of innovation, such as the incorporation of media elements besides type. Her visual aesthetic in Patchwork Girl was "deliberately retro," based on the early graphics program MacPaint, already obsolete in the early nineties: using it was "like working in woodcut." Aiming at a "retro" aesthetic was a way to assert the linkage of old and new. She also speculates on her experiments with nonlinearity without using devices such as footnotes, indexes, or loose-bound pages; though she notes somewhat ruefully that reading Patchwork Girl is not much easier than it is to read experimental print works produced with those devices. Jackson, Interview 5, "Thinking Outside the Screen"
Grigar asks about constraints, affordances, and more about the influence of the medium on the message in Patchwork Girl. This brings to mind Tristram Shandy, which Jackson says she regularly teaches in her writing courses, and the fact that students bring in editions of Sterne in which the original conception is badly betrayed -- with the famous Black Page reduced a black box, for instance. How do we draw the boundaries of a literary text? What belongs to the text? Thinking about these questions has pushed Jackson beyond both the page and the screen, into projects that explore the way literature lives in a larger world. Books, she says, now seem to her not at all identical with the words on their pages. In encountering a book, we have to think about the entire cultural/commercial machine that accounts for its existence. Grigar turns to the planning and compositional work that underlies Patchwork Girl. There was "a lot of trial and error," Jackson notes. She reveals that there was at some point an aborted draft of Patchwork Girl, in which all the words were as intensely linked as possible, producing a "Brillo pad" of swarming connections. Finding this structure unacceptable, she started over: "So I just erased all the links!" [Note the delight with which this is said.] The current text grew out of a more considered deployment of links in discrete lines and threads. The "Broken Accents" section is indeed the remnant of that aborted first draft, and the most densely linked part of Patchwork Girl. Grigar asks about influences: Landow, Coover, Ronell, Haraway -- Mary Shelley, obviously -- but others? And what about the influence of Jackson's work on other hypertextualists? Jackson calls to mind Judd Morrissey and Lori Talley's work, My Name is Captain, Captain (also published by Eastgate). Like Morrissey and Talley's earlier Jew's Daughter, this piece subverts the conventional node-link transitions of hypertext. Any word in these works is useable for transition, but instead of flipping to a defined page when a word is clicked, the work rebuilds its text computationally on the basis of the given word. Jackson praises the way this work "pulled the rug out from under you but still somehow retained continuity and a sense of narrative presence." She laments the celebration of hypertextuality for its own sake and insists on a productive "tension" between a conventional kind of reading, "giving the words substantial weight" versus disorientation and the obligation of the reader to take active part. In this respect she is more interested in longer-form versions of electronic writing rather than the intensely fragmented versions of hypertext that came after the first Eastgate works. This part of the interview ends with Grigar asking about Jackson's awareness of women in hypertextual writing, and the critical reception of her work. Jackson has no answer here, saying she is "averse to reading about myself," and therefore unaware of critical responses. Jackson, Interview 7, "After Patchwork Girl"
Grigar asks about literary life after Patchwork Girl: How has Jackson moved from then to now, and what sorts of continuity exist? This will be a long answer, Jackson warns; looking back, though, she finds it interesting how much her work seems related to Patchwork Girl. Immediately after Patchwork Girl, she wrote the semi-autobiographical Web piece My Body, then the story collection Melancholy of Anatomy, which like Patchwork Girl is an attempt to explore particularity (body parts and fluids) within the context of a unifying scheme (the medieval Humours) -- but circular rather than linear. Her novel Half Life is about conjoined twins, hence monstrosity, and "the fuzzy boundaries of the self." It features a two-headed narrator who is never sure which head is doing the writing, and a "barely held cohesion of text mappable onto a body." Skin is an ongoing effort to write a story onto the bodies of human participants, who will go out into the world and "remix themselves." "Skin is what the Patchwork Girl became after she fell apart." Grigar turns to the question of the intended or ideal reader. One answer is George P. Landow, for whom the first version of Patchwork Girl was meant. (This is said somewhat playfully.) Beyond Landow, her ideal reader was "someone who was alert to the theoretical implications;" or "an imaginary someone like me." Grigar asks if Jackson feels she has been in any sense misread. Jackson regrets that some (many?) critical readers of hypertext have had "a pre-existing critical agenda," either to celebrate or denigrate new media. This results in readings that concentrate too much on technology and technique, and not enough on the larger sigificance of the work. "It's like reading Tristram Shandy exclusively as a demonstration of [Sterne's] theories about the book." Experimental books are not "treatises on bookness." "I would like to have a reader who is . . . trying to see what [the work] is in itself, and not only as a representation of a class of experiments." DG: Could hypertext have come (or will it come) closer to the mainstream? Jackson responds by wondering why anyone would want that. "Experimental literature has no mass audience." Jackson, Interview 9, "Examining Obsolescence"
DG: How do you feel about our attempt to hold onto Patchwork Girl? Jackson: "The desire to hold [things] together is doomed and unhealthy . . . . Literature is a way to learn to let go of ourselves." So trying to hold onto any authorial self, or product of same, is "hypocritical." "Having said that . . ." she hedges. Disappearance of the work [as in the Skin project] should be part of the work's own logic. So it's okay for others to preserve Patchwork Girl "so long as it doesn't misrepresent my purpose in writing it." Part of the logic of Patchwork Girl was to disclaim ownership, but this is problematic. In Skin, Jackson discovered that the readers (who carry the words) basically took over the text, overturning the conventional literary model of an author and an ideal reader.